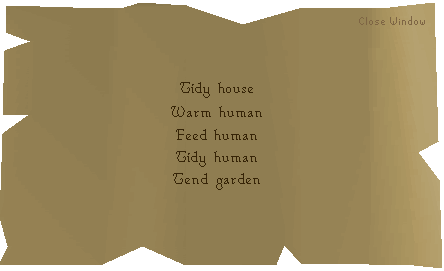 If you are looking for the modern RuneScape guide for this content, please see our A Tail of Two Cats guide. Begin by speaking to Unferth in Burthorpe. Firstly, head to Burthorpe and talk to Unferth. He will ask to see your cat and then he will tell you that Bob is missing! He will tell you that he last saw Bob on a Monday, and he will suggest that you talk to Hild. Speak to Hild and tell her that you have come to ask about Bob. Strangely enough your cat and Hild can understand each other, so there will be some dialogue between them. She will ask for 5 Death Runes to make an enchantment on your CatSpeak Amulet. She will enchant the amulet and tell you how to use it. Now open up your amulet by choosing the "Open" option on the right-click menu. 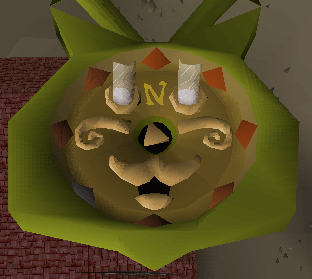 When you activate the amulet, the face of a cat will show up, and by following the instructions above you'll find the direction of Bob. Once you have found the correct direction, the eyes will light up and the mouth will move! Now this is the tricky part: Finding Bob. Once you have found him, he will tell you he has left Unferth because he has fallen in love with Neite. Then a sickening dialogue will start and you have to head to Gertrude to find out who Bob's parents are. Talk to Gertrude and she will call Bob the big tomcat who hangs by the Hero's Guild. But she doesn't know much about him. Then your cat will tell you about Robert the Strong, however Gertrude knows nothing about him. 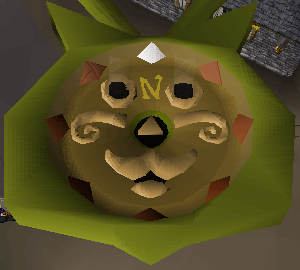 The only one person to go to now, Reldo the Librarian of Varrock, found in the Varrock Castle library in the northern part of the castle. Ask Reldo about Robert the Strong and the dialogue will describe him a bit. Then your cat will say Robert the Strong is Bob. Go back to Bob he will say he knows nothing of his Robert the Strong and then your cat says we must go to the Sphinx. Talk to the Sphinx from the Icthlarin's Little Helper Quest, located in Sophanem. He will tell you that he too has noticed something about Bob, and then you have the option of either viewing a cutscene (around 5 minutes long), or just reading a summary of it. Then Bob will ask you to help Unferth while he is away. When the cutscene ends, go back to Unferth's House. Tidy House - Make the bed in the corner. Warm Human - Light a fire in the fireplace with Logs and a Tinderbox. Feed Human - Use a Bucket of Milk and a Chocolate Cake on the table. Tidy Human - Use a pair of Shears on Unferth to cut his hair. Tend Garden - Grow some Potatoes in his garden. Now Unferth says that he is ill. Go to the Apothecary in Varrock and he'll give you a Doctor Head Gear or a Nurse's Head band. Now you need white robes and a vial of water. Talk to Unferth and you will give him the Vial of Water that he thinks is a potion, then go and find Bob again using your talisman. Then you will see a cutscene, and afterwards, speak to Unferth again to complete the quest. Congratulations, Quest Complete! 2 Antique Lamps - gives 2,500 experience to any skill that is level 30 or higher. Mouse Toy - for playing with your cat!